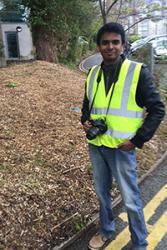 Bangor University international student, Nebu George, has been appointed as Menai Science Park Ltd’s archaeology intern. The company recently received outline planning permission for M-SParc, a state-of-the-art science park in Gaerwen on Anglesey, and the archaeological survey is part of the conditions for full planning permission. The project, which will receive Welsh Government funding of £10 million, aims to create a unique cluster economy to encourage hi-tech industry and scientific research partnerships in north-west Wales. The project is also applying for ERDF European funding. Originally from Mumbai, India, Nebu, 26, is currently in the 2nd year of B. A. (Hons.) Archaeology and was selected as part of Bangor University’s Undergraduate Internship Scheme, administered by the Bangor Employability Award (BEA) team in the Careers & Employability Service. As part of the 150-hours of work to be undertaken, Nebu’s main tasks will include completing a photographic survey of existing buildings on site, as well as forming a part of the team that will undertake archaeological studies on the site. M-SParc’s 30-year vision is based on creating highly skilled long-term employment opportunities for local people and Bangor University students, developing a knowledge sharing environment and creating an economic hub in sectors such as low carbon, energy and environment and ICT. The science park would create a bridge between such companies and Bangor University, owners of M-SParc.